Nice Côte d’Azur Airport is an international airport near the city centre of Nice. This gateway to the south-eastern coast of France serves Côte d’Azur (the French Riviera), Alpes-Maritimes department and the sovereign nation of Monaco. Including helicopter flights to Monaco, Nice’s hub airport welcomes around 11 million passengers per year. Nice Côte d’Azur Airport (IATA code: NCE) is the third-busiest airport in France and the focus city for Air France, easyJet and HOP! Flights to Nice Côte d’Azur Airport are provided by international airlines such as Austrian Airlines, Emirates and Air Canada. NCE is a 20-minute drive from the city centre of Nice. Book your cheap flights to and from Nice Côte d’Azur Airport online! Nice Côte d’Azur Airport is a beautiful international airport situated close to the coast of France. Providing a gateway to one of the most beautiful cities in Europe, this airport is one of the busiest in the country. Nice’s hub airport schedules flights throughout Europe, Asia and North America. The many passengers who have the pleasure of passing through this airport will get the opportunity to enjoy its wide variety of services and entertainment offers. Get ready to discover the beautiful scenes of southern France courtesy of the vibrant Nice Côte d’Azur Airport. 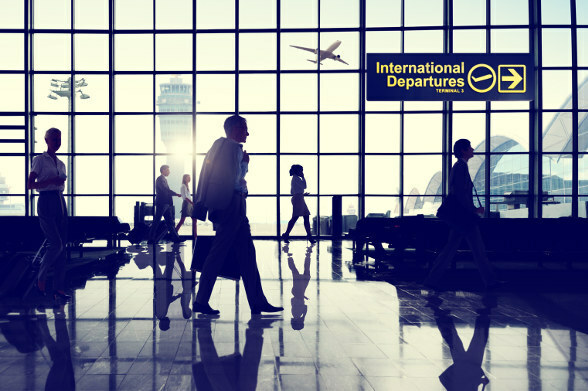 As a major international airport, NCE includes a number of outlets offering you retail therapy and the convenience of being able to start settling into your holiday experience in France. These shops sell a variety of products, including fashion, accessories, jewellery, newspapers, luggage bags, refreshments and more. When you’ve gotten all the shopping out of the way, satisfy your appetite with the many meal options available at numerous eateries situated throughout the airport. These establishments offer menus that include gourmet dishes, scrumptious foods, delicious desserts, energising refreshments and top-quality alcohol. Nice Côte d’Azur Airport offers passengers 4 luxuriously furnished lounges, which are situated throughout the airport’s two terminals. These locations offering comfort additionally include features such as free Wi-Fi internet, free work equipment, buffets, snacks, TVs and bars. Make sure to adhere to the baggage restrictions when you find yourself at this international airport in France. Other features and services that you can make use of at Nice’s hub airport include a business centre, meeting rooms, a service centre, free Wi-Fi, prayer spaces, as well as play areas for children. Campanile Nice Airport This charming 3-star hotel in L’Arenas is within walking distance from Nice Côte d’Azur Airport. Amenities include a restaurant, breakfast, 24-hour business centre, 24-hour front desk, air conditioning, daily housekeeping and laundry service. Free Wi-Fi and free airport shuttles are available as well. Novotel Nice Arenas Aeroport This classy 4-star hotel is within walking distance of Nice’s hub airport. It includes features such as a computer station, air conditioning, 24-hour front desk, self-parking, beach access, daily housekeeping and in-room childcare. Free Wi-Fi and free airport shuttles are also available. Hotel Le Negresco This beautifully-situated 5-star beachfront hotel near Place Massena is a 12-minute drive from the international airport. Its collection of amenities comprises of 2 restaurants, air conditioning, breakfast, in-room childcare, beach umbrellas, airport shuttles and a 24-hour business centre. The accommodation offer includes free Wi-Fi. You can order foreign exchange as early as 60 days before collecting. Take note that collections of foreign exchange can only be done in person. American Express Change offices are situated in Terminal 1. The bank of Populaire Côte d’Azur also offers currency exchange services, in Terminal 2. ATMs are available in both the arrivals and departure levels of Terminal 2. Nice Côte d’Azur Airport includes several parking options, suitable for short and long-term stays. You are welcome to book a parking space beforehand on the airport’s website. Nice Côte d’Azur Airport is situated 6 km to the southwest of central Nice. Accessing the airport is easy with travelling options such as taxis, buses, trains, Uber and car rental.